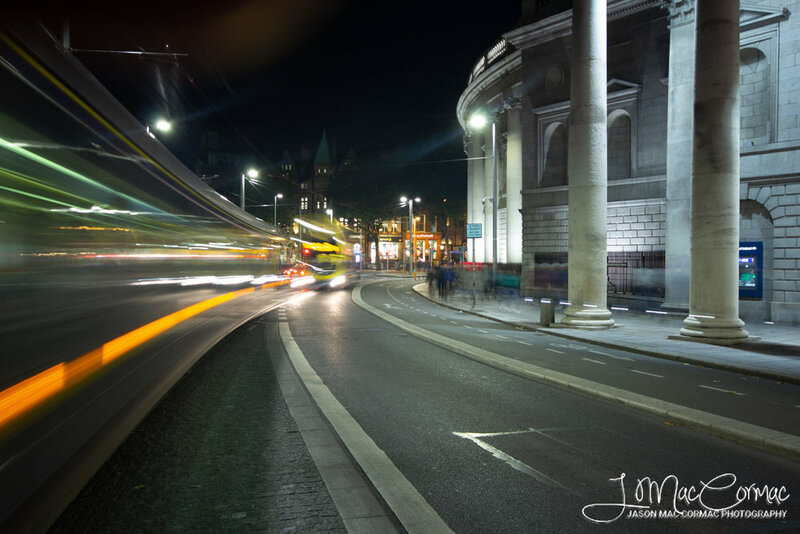 Jason Mac Cormac Photography — Dublin City. A photowalk. For this photowalk I started at a famous bridge that crosses the River Liffey. As the sun was setting and in that magic hour when day becomes night I arrived at the Liffey a little later than hoped but not to be deterred I had a look around and decided upon an image. The view toward the Four Courts, currently have a hairdo by the looks of things, was like a scene from Paris or Rome the light of the sun still catching the clouds and bathing everything in a golden light. This was a joy to behold. Dublin bathed in golden light reflecting in the River Liffey. As the sun had finally set the blue dusky hues appeared in the sky, my favourite time of day, made all the more magical by the Liffey being so calm, hardly a ripple on the surface. I quickly set about composing an image of the Ha’penny Bridge from the left hand side. I then moved to the right side of the bridge which I feel gave a more pleasing scene. There were plenty of people rushing about but with careful timing of the shot with a green for go on the pedestrian traffic lights and a longish exposure I was able to remove most of them from the scene. Leaving a few isolated figures deep in conversation, I particularly like the couple of girls on the far side of the river and the guy chilling out leaning against the wall as they add some scale and interest to the image. River Liffey acting as a mirror to the beautiful Hapenny Bridge at dusk. This is my favourite all time image of the Ha’penny bridge, especially following some subtle edits, you could say its been ten years in the making. Ten years ago I took a black and white image of the bridge which was hugely popular, it was my first serious photograph of the bridge and every couple years I come back at different times of the day or year to try and better it. This image and the near perfect conditions is another level, I might be another twenty trying to get better :) I’ve already had a few enquiries for this image, as it’s gone viral online, even had a lovely framed print made which is hanging on a wall right now as a beautiful piece of art. Happy with the images of the Ha’penny I walked up toward O’Connell Street Bridge on the opposite side of the quays. It was getting a little too dark already meaning I’m not overly happy with the images, and possibly because I felt self conscious on the boardwalk taking images whilst a few undesirables were lurking about. I didn’t hang around too long. Not that I felt at risk or anything, my tripod could prove useful, it was just difficult to become totally immersed in the image making process and at same time having one eye to the surroundings. Blue hour passing by at O’Connell Street Bridge. I ventured a little further across from Liberty Hall and just before Tara Street Dart station to take another shot. A pleasing scene but full of contrast in light making it challenging to capture in one image. The sky was dark shade of blue and the lights bright. Nonetheless a pleasing image I think of the Custom House with tricolor shades lighting the building, green white and gold reflecting in the Liffey. Dublin skyline with the Custom House. After this image it was pitch dark I packed up and started back towards the car. I had almost called it a night, but couldn’t resist photographing College Green with the newly installed Luas line, and then on to take another image of the best looking wee pub in Dublin, The Bankers. College Green and passing traffic. What a great evening for a walk with the camera, and some nice images too. All images are available to purchase as prints or to license. Contact me by email or phone to discuss. A location I always like to visit, especially at blue hour when the water is still. The reflections of our beautiful city in the Liffey can be amazing. This photo is a little unusual in that the bridge was cordoned off and a massive hoist had workers fixing the light on top of the Samuel Beckett Bridge. Evening light in O'Connell Street featuring the magnificent architecture, statue of Jim Larkin, and the Spire as the crowds go by. Unusually red sunset was the result of the ash plume from a volcanic eruption in Iceland when all the planes acrosss Western Europe were grounded for safety precautions. The sunsets were the most vibrant I've ever seen and the perfect backdrop to silhouette the deer. Beautiful pastel shades in the sky at dawn in the Phoenix Park. The last of the morning frost melting away. Dublin city during blue hour just after sunset on a still night. Samuel Beckett Bridge and the National Convention Centre illustrating the modern metropolis that Dublin is becoming. Rocks on the shore looking out toward Sandycove at sunrise taken from Dún Laoghaire. Joyces Martello tower can be seen on the horizon.